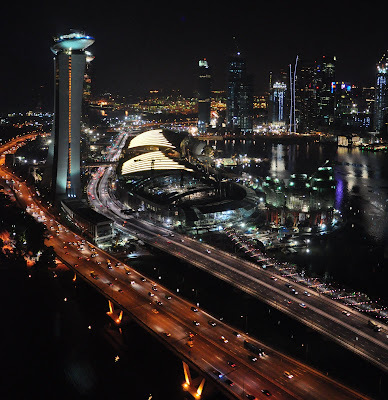 I have been on the Singapore Flyer several times....yes, I know it is a tourist thing but hey! Where else can one view the Singapore city skyline? Personally, I think you can get a nicer city skyline at night. This is especially if there is construction going on (which in Singapore’s case, it is almost an everyday affair). In the day, it is just boring construction sites but in the night, even the lights surrounding the construction site make the area more "fairy like". If you are up there anytime during the day (worst time is high noon), it can get quite hot inside the capsule even though it is air-conditioned. Personally, being a pampered soul, I prefer a cool environment than a heated up capsule.